This makes me want to rip a man's clothes off Basenotes was once told. The bottle is based on ancient Roman monuments as Laura Biagiotti likes buildings. There are 53 reviews of Roma Uomo. I tested this recently and to me, this is a vanilla version of Chanel's Bleu eau de parfum. The grapefruit and benzoin combo recreates the incense/sweet amber/sour citrus illusion in Bleu while the patchouli accord ties these two perfumes together. It's nice, but I sense some Iso E Super going on here that to me makes this perfume very strong, the sillage is a considerable amount well past arms length although this in no way comes across as synthetic. I had dabbed on a copius amount in a concentrated area on the top of my foot and was catching a moderately strong sillage that was very enjoyable although pretty sweet in feel thanks to that healthy dose of benzoin. Seriously, these two perfumes are quite similar in their olfactory make up and how both compare in smell, the only difference is that Roma Uomo is more green as opposed to Bleu that's obviously blue in feel. This scent has been assembled well, there's a nice separation of notes with a distinct dry down and it's kind of a unique odor. I'm not a fan of anything vanilla so I can't wear this but, I can definitely see and appreciate what's been done here. Yet another decent, though slightly dated, fragrance that reflects its time quite well (1994). Roma Uomo feels complex and sweet, almost to a fault. There’s a lot of citrus, spice, and woodiness going on in this one. The cocktail is quite lively, and the result is a fragrance that can be worn by young or old who are energetic and special in personality. Great for casual, informal events all year round, as well as romantic outings. 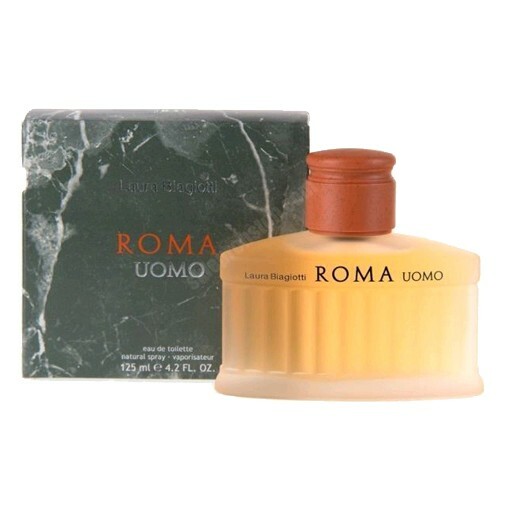 Roma Uomo does feel classy and welcoming to wearer and smeller alike. Still relevant and wearable today overall, but warrants a test spray as it may feel too heavy for some. Sweet citrus, almost too sweet and fruity, like a candy perfume that some might not take seriously, but I love it, especially the opening. I find it to be formal for a sweet fragrance. The opening is so delicious, I find it hard to conceive that someone might not like this. This gets a ton of compliments, can be worn by any age group (my son and my nephew love it) yet it's mature enough to be worn by a grey hair like me. Attractively pleasant. Hows that for being pithy and getting to the bottom line. You don't have to spend a ton to smell great! One of my all time favourite fragrances. I love the mediterranean fruits combined with the warm spices. It's never overbearing or oppulent, always subtle and elegant without being generic. One reviewer here said that it evoked a sense of old Imperial luxury and I see what he means and I agree. Roma is very luxurious and rich but not loud and powerful. Roma knows how to behave himself and he is a well educated man of the world. There are no member images of Roma Uomo yet. Why not be the first?